Filetto, or filet mignon, is one of the most voluptuous of all beef cuts, and because of its popularity and ease of preparation, there are a great many recipes for it. Here is a zesty Italian way of preparing filet mignon, simple but -mouth--watering. In this recipe, the complexity of flavors in the sauce comes from the reduction of the balsamic vinegar. The traditional balsamic vinegar is delicious but expensive, so when making this reduction, use one of the different offerings of balsamic vinegar you find in the grocery store; it will yield a great sauce. If you feel extravagant and have one of those little precious bottles of the Balsamico Tradizionale—seven years old, aged in wooden casks in the solero method—instead of making the reduction from the commercial balsamic vinegar, just drizzle some of the Tradizionale over the filet. The Balsamico Tradizionale, made by selected producers, is always sold in the signature bottle with an onion like base. The bottlers are different, the bottle shape the same and the product sublime. 1.Preheat the oven to 450 degrees F. 2.In the meantime start the balsamic vinegar reduction. 3.In a medium saucepan, combine the vinegar, carrots, celery, onion, bay leaves, and rosemary needles. 4.Bring to a boil, and simmer until the vinegar has reduced by half, about 30 minutes. 5.Strain the vinegar into a clean saucepan, and keep warm. 6.Discard the vegetables and herbs. 7.Season the beef with salt, and coat with the olive oil. Heat a -cast--iron skillet over high heat. When the skillet is hot, sear the beef on all sides, then set the skillet in the preheated oven to roast until -medium-rare, about 15 minutes. Let rest on a cutting board for 10 minutes, then slice. 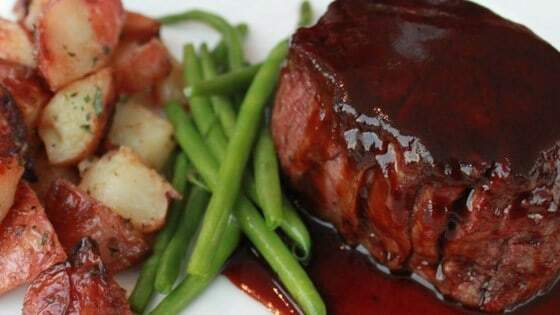 To serve: Once the filet is sliced, sprinkle with coarse salt and drizzle with olive oil, then with a spoon lightly drizzle the filet slices with the balsamic-vinegar reduction.